Be afraid. Be very afraid. Being afraid of God seems foreign to those of us who view God as the Lover of our Soul, who sing of His blessings, and who trust Him with our eternal soul. Nevertheless, there are times in my life when I’ve struggled with the concept of what it means to fear God. That’s why, when I recently came across a definition of fearing God in Drew Dyck’s book, Yawning At Tigers: You Can’t Tame God, So Stop Trying, I spent time meditating on it. Fearing God doesn’t mean we cower in His presence—like a dog who knows he’s displeased his master—nor does it mean we run and hide instead of joyfully approaching Him. Instead, we embrace the fear of God because we recognize His to-be-feared characteristics, such as His all-powerful wrath toward sin, His unending sovereignty, and His unapproachable holiness, are an accurate understanding of who God really is. The fearfulness of God is a reality, even if we don’t like it very much. We should fear God. We should be in awe of His wrath and His judgment. Yet, at the same time, we should have peace, knowing He is shielding us from wrath, sheltering us in His arms forever. January 1st is a day of promise. To many, it holds the enticing thought of a brand new start, a day to wipe the slate clean, to begin anew. January 1st could rightly be renamed The Day of Hope. We hope to lose weight, get more sleep, eat healthy. We hope to be more productive, not procrastinate, get organized. We hope to get a better job, earn more money, buy a new house. But, so much of what we hope for tomorrow will just be wishful thinking. There’s a different kind of hope that’s not just wishful thinking. It’s a hope centered on Christ, a confidence that what God has promised He’ll bring to pass. I like to think of hope as the future tense of faith. How can we have this hope that’s not just wishful thinking? Romans 10:17 says, “Faith comes by hearing and hearing by the Word of God.” It’s the Word of God that makes faith and hope possible. All of your days in 2019 can be A Day of Hope by reading God’s Word. Check out these Daily Bible Reading Plans for hope-filled days in 2019. Is it possible to know God? Without realizing it, this young lady had made a profound statement. There’s no way anyone can know God except through the study of Scriptures, the revelation He’s given us about Himself. The best way to learn about God is to read, study, and meditate on the love letter He’s written to us. Although I met my husband-to-be when I was sixteen years old, we lived a thousand miles away from each other and never had the opportunity to spend any time together. I understood why my friends and family were surprised when I announced that James and I were getting married only a couple of months after my eighteenth birthday. What they failed to grasp was that James and I had been corresponding with each other regularly for almost two years, and because of those letters, we’d come to know each other as well as many couples who’d been dating for several years. While this illustrates the concept of getting to know God through reading His Word, it fails to portray the real picture of how intimacy with God is possible through the study of His Word. This truth can only be experienced when a believer spends time in the Word every day. This is the way God has chosen to build a relationship with His children. This is the way God speaks to His children, and this is the way His children learn to recognize the voice of the Father. If you truly “want to know God,” become familiar with the sound of His voice through His Word. Placing trust in someone doesn’t mean they are trustworthy. Trusting a chair to hold you up doesn’t mean it’s sturdy enough to do the job of bearing your weight. Trust must have a basis. Otherwise, it’s not to be trusted. Trust is a word that’s being discussed a lot these days. That’s probably why I was intrigued by a story about trust in the Old Testament. Without getting too caught up in the details, here’s the background: The King of Assyria sends an army to fight the Israelites led by King Hezekiah. When the envoy from the King of Assyria arrives outside the gates of Jerusalem with a huge army, he has a message for King Hezekiah. “On what do you rest this trust of yours?” Hezekiah rested his trust in the Lord. His trust was in the Almighty God, the God of his fathers, his Creator. He trusted Him for deliverance rather than an army of thousands. This was a trust to be trusted. Hezekiah’s trust was well-placed. God delivered the Israelites from the Assyrian army in a miraculous way (2 Kings 18-20). 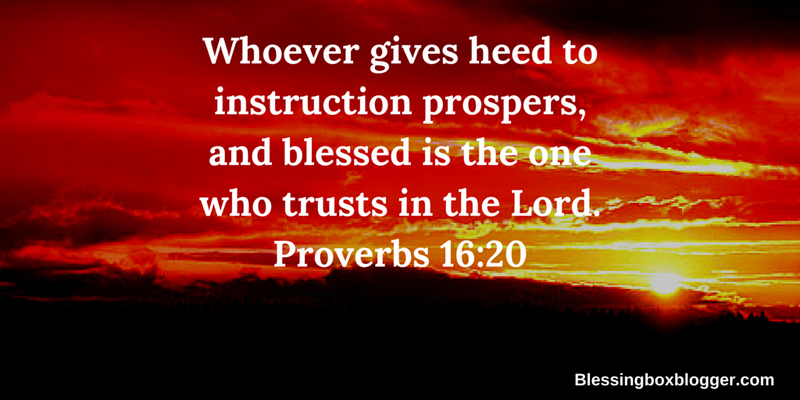 One of Hezekiah’s ancestors, King Solomon, left instructions about how to trust the Lord. Those instructions are found in Proverbs 3:5-6. They involve two commands. 1) Don’t rely on your own understanding and 2) Acknowledge the Lord’s right to control your life. Often, God’s work in our lives seems hidden, a barely discernible matter. That’s true in the life of an individual, the life of a church, and especially in the world itself. Yet, the Bible assures believers this is simply not the case. God is doing something in all areas of our life, our church, and the world. He’s doing it all the time. So, what is God doing when we can’t see what He’s doing? When God made His presence known to Moses through the flame shooting up from the non-burning bush, He told Moses what had been going on with Him while the children of Israel were suffering under the oppression of the Egyptian pharaoh. God said, “I have surely seen the affliction of my people who are in Egypt and have heard their cry because of their taskmasters. I know their sufferings” (Exodus 3:7). That’s what God was doing then. That’s what God is doing now. He’s doing it in your life and He’s doing it in my life. He’s doing it throughout the world today. God told Moses He “had surely seen.” Nothing escapes His attention. He sees it all. From the beheadings in the Middle East to the hairs on my head, not one thing gets past God. He’s observing every minutiae and every big thing. God said He “had heard.” Not one word coming from my mouth escapes God’s ears. He hears my sweet words as well as my harsh words. He hears what your boss utters as well as what you utter about your boss. He hears words of profanity and words of praise. His ears are never closed; He hears it all. “I know,” God said. God is aware, thoroughly knowledgeable, about me. That means He is completely cognizant of my every thought, my every motive, my every desire, my every sin, my every . . . my everything. This is true of a church body. This is true of a family, This is true of a nation. This is true of our universe. When God told Moses what was going on with Him, He did so, not to instill fear, but to give Moses comfort. Moses was afraid of God, so God wanted to reassure Moses that the manifestation of His presence wasn’t to be feared. God described what He was up when He spoke from the midst of a flame in a non-burning bush. God did it again when He spoke in the form of His Son Jesus. “The Word became flesh and dwelt among us” (John 1:14). We can be comforted by what’s going on with God both now and in the future. God not only told Moses what He was doing in the present, He also told Moses what He was about to do for His children. “I have come down to deliver them” (Exodus 3:8). God will do the same for His children today. “Yes, I am coming soon” (Revelation 22:20).